Romania is home to the Transylvanian Alps, gothic architecture and of course Dracula. A group tour here is like stepping back in time - the locals get around in horse and carts alongside everyone else whizzing around in their Dacias! Take a trip with Explore to discover the highlights of this intriguing country. Romania's capital, Bucharest, has emerged from behind the Iron Curtain as a bustling modern city, but it still bears the mark of what is probably the most obvious reminder of the country’s communist past; the gigantic Palace of Parliament or Ceausescu's Palace as it’s also known. This controversial building is the fourth largest in the world and a large number of homes were demolished after construction began in 1984 to make way for its lavish marbled interiors and crystal chandeliers. On an Explore adventure to Moldova and Romania you can discover not just the capital of Romania, but also of neighbouring Moldova, along with the Romanian vineyards, mud volcanoes and rock-hewn churches found along the way. As well as being home to the spiked turrets and pretty inner courtyards of Bran Castle, which according to Bram Stoker’s novel was the home to the blood sucking Dracula, you can also see Peles Castle and Pelisor Palace when visiting Romania; both of which are far more lavish than their better known neighbour. The Neo-Renaissance architecture of Peles will leave you breathless – every inch is covered with silk, jewels, paintings, marble, weaponry and countless other fine objects. Travelling north to the Bucovina region in Romania you can marvel at a collection of Medieval painted monasteries including Moldovita, Sucevita and Putna. What makes these buildings astonishing is that whilst most Romanian churches have frescoes inside, which have fantastic artwork coating the exterior walls. These vivid Biblical images were used to educate in an exciting graphic fashion. Painted during the 16th century, the frescoes are a fusion of formal Byzantine style, with colourful folk art. These Romanian monasteries are now UNESCO World Heritage Sites, but are also still home to communities of nuns and monks. Romania’s natural heritage has been astonishingly well-preserved. The Carpathian Mountains traverse the heart of the country in a formidable arc of jagged peaks, impassable ridges and forested gorges hiding a wealth of caves. Below our feet, the ground is rich in salt and there a number of huge mines dotted around the country. Another traditional production process you can see off the side of the roads are the burning mounds used to make charcoal. Romania is home to one of the largest areas of ancient and undisturbed forest in Europe, not to mention significant populations of bears and wolves. Whilst on the Black Sea coast, the Danube River concludes its journey by splitting into a maze of waterways and marshes teeming with some 300 plus species of bird. The Romanian bear population is one of the few strong and healthy sets remaining in Europe with the Carpathian Mountains being home to about 43% of all European bears. Travelling to Romania in the spring offers the chance to see bear cubs taking their first steps. Towards the end of the summer, the bears will be more active as they seek out food to increase their weight before hibernating for the winter. On Explore’s two week Best of Romania Holiday you will spend a couple of nights on a pontoon - a barge style vessel resembling a large house boat – to see the abundant birdlife in the Danube Delta. The wetlands cover over 4000 square kilometres and its small waterways, reedy channels and tranquil lakes hidden within the backwaters are a premier wildlife sanctuary and paradise for birdwatchers and photographers alike. Vast quantities of birds congregate here, including white pelicans, grebes, falcons, egrets, swans and cormorants. Here you can also find some of the most remote settlements in Europe, far away from the nearest roads. Romania is a beautiful Winter Wonderland with snow tipped castle turrets and rolling snowy mountains. You can also have the unique experience of spending the night in an Ice Hotel above Lake Balea. 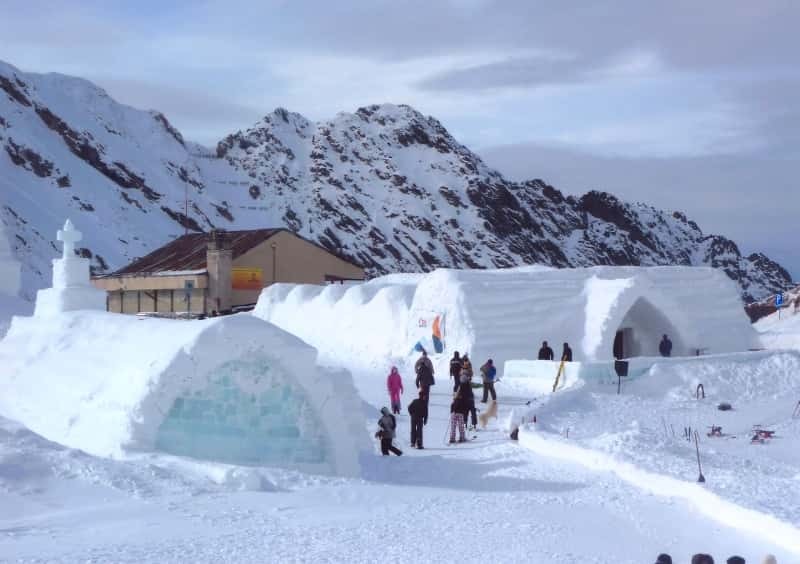 Reached only by cable car, you can dine in the Ice Restaurant, pray in the Ice Chapel and sleep on beds made of ice, as well as having fun snow shoeing and tubing. Other scenic spots in winter include the birthplace of Dracula, Sighisoara, with its pretty hilltop church, winding cobbled lanes and colourful town square and the fortified 13th century church at Viscri. You can read more about our own staff’s Winter Adventures here.